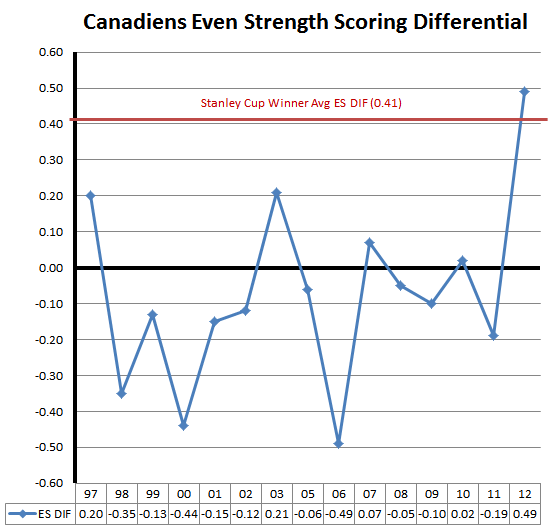 In my preview of the Montreal Canadiens 2012-13 season, I discussed the path the Habs needed to take if the days of 6th to 8th place finishes with "Anything can happen!" playoff marketing were to be no longer considered successful campaigns. The path was simple but it required a paradigm shift in Montreal: 1. Stop playing passive and start pressuring the opposition all over the ice and 2. Stop making roster decisions regarding power play "specialists" (code for lousy at even strength) and start focusing on players capable of imposing their will on the road at even strength. In an era of declining penalties, living and dying on special teams is fool's errand but for the last 14+ years, special teams play has been the cornerstone of every short-sighted retooling attempt to turn this franchise around. Until now. For those who think the Habs success this season is merely the result of remarkable health, take a long look at that chart. For the first time in over 14 years, spanning many relatively healthy seasons, Marc Bergevin and Michel Therrien have elevated the Montreal Canadiens into the realm of Stanley Cup contenders, outscoring opponents so far this season at even strength by almost half a goal a game. That's more than twice what any Habs team has managed to achieve since 1997-98. Only the Carolina Hurricanes (+0.12) coming out of the lockout in 2005-06 and the Los Angeles Kings (0.0) last season managed to win the Stanley Cup with a low even strength scoring differential since 1997 and none in 14+ years have won a Cup with a negative ES DIF. A depressing mark considering the Habs have been a negative ES team for 10 of them. But hey, anything can happen in the playoffs, right? Teams built to win on the road have an overwhelming tendency to win at home while teams built to win at home. especially those with an over-reliance on special teams, tend to lose on the road. So, for teams that squeeze into the playoffs and play most of their games on the road and in Game 7's where there's virtually no penalties called, it's easy to see why 86% of Stanley Cup winners since 1997 have won it with strong even strength teams. Finally, for the 1st time in a very long time, Marc Bergevin and Michel Therrien have turned the Montreal Canadiens into a legitimate Stanley Cup contender, thanks to a paradigm shift that strong even strength teams are better than those built on special teams. Finally indeed. With a shortened season, it's important to remain a bit cautious about how the Habs system would hold up to 82 games of opposition adjustments and injury but at this point, even a staggering slump would have their even strength play the best it's been since 1997. For Habs fans seeking signs this organization has finally taken the right path forward, this is the best one yet.